St. Katharine Drexel Parish Community consisting of St. Paul Church and All Saints Church, and St. Paul School. Deacon Walter J. Karpecik, Jr.
St. Paul Church has been serving Burlington for over 164 years. Its first Pastor, Rev. Daniel Margorien, performed his work in an old building that had once been a barracks used by the English during the Revolutionary War. In 1845, a building was purchased on East Broad street along the banks of the Assiscunk Creek. The building was originally constructed in 1759 for the purpose of house British Troops during the French and Indian Wars. The first Mass of St. Paul Church was held there in 1849. This building served as both the Church and Rectory. In 1864, the church was remodeled after a building along side was purchased to house the rectory. This became the first year of our incorporation. The first catholic school in Burlington was opened in the basement of the church in 1870. In 1904, Rev. Russi purchased and remodeled a building on East Broad Street. This new building became the new rectory for the Church. He also built the first St. Paul Parochial School on East Broad Street. The old St. Paul Church Building is now the residence of the Knights of Columbus. The old rectory is now a private residence and the first school was demolished in 1961. In 1914, the church purchased a large house located on the corner of St. Mary Street and East Union Street. This house became the Santa Maria Academy and taught seventh and eighth grade students. Several years later, the building was moved to Barclay Street to make way for the new St. Paul Church. In 1916, Rev. Russi continued purchasing buildings on the corner of St. Mary St. and East Union St. Included in this purchase was a building known as the Budd Mansion. This large home became the new rectory for the parish. Across the street, the Binney Homestead was purchased and became the new convent for the Sisters of Mercy. The corner of St. Mary and East Union St. became the site of a new magnificent building, the present St. Paul Church. The new Church was completed and the first Mass was held in 1925. In 1959, Rev. Miller broke ground for the building of a new school on James St. The new school was completed and dedicated in 1960. All Saints Church celebrated 100 years in our community in 2010. The parish was founded in 1910 by Rev. Andrew Szostakowski to serve Burlington City's polish community. The first mass was held on Palm Sunday, April 19, 1910 at a rented Hicksite Quaker Meetinghouse. Nine months later the parish purchased the 1845 Meetinghouse. On November 29, 1911 the Meetinghouse was blessed and dedicated as a temporary chapel. The Parish also purchased two houses on 500 and 502 High St. to serve as the rectory and convent. On the site of a nearby old Carriage works, the parish erected a school. The parish had out grown its building and erected the existing church in 1959. The current Rectory is a mid-1800's italianate style stucco and brick structure. The Convent is also stucco and brick and was built around the same time as the current rectory building. Families need to be registered in the Parish before registering for St. Paul School or Religious Education. Registration can be made at the Parish Office, located at 223 East Union Street, Burlington, NJ 08016, Monday through Friday, 8:30 AM—4:00 PM (Closed 12 Noon—1:00 PM). If you are moving out of the Parish area or to a new address within the Parish, please call the Parish Office. Please call the Parish Office to notify clergy of hospitalization and to receive the Sacrament of the Sick, Holy Eucharist or Reconciliation. In serious illness, please call the Rectory by calling (609) 387-8191, day or night. Please leave a message. Plans for marriage should be made one year in advance of the wedding date. This ruling is in accordance with the common policy of the Diocese of Trenton. 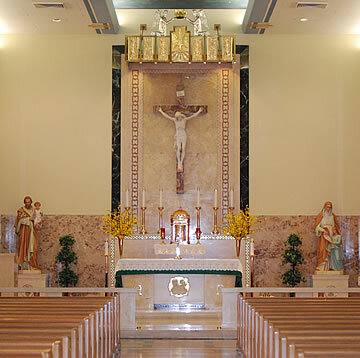 Couples are required to attend either Pre-Cana or Engaged Encounter. Details and arrangements are to be made through the Pastor, Parochial Vicar, or one of the Deacons. Baptism for parishioners take place on the second Sunday of every month at St. Paul’s Church, 223 E. Union St., Burlington, NJ 08016. A Baptismal Preparation class is required for parents and godparents the Thursday night before the Baptism. This class is held at 7:00 PM at St. Paul Church. Please contact the Parish Secretary to make arrangements. Only one godparent is required for Baptism. If two are chosen, one must be male and one female. A godparent must be a practicing Roman Catholic (baptized, confirmed), attending Mass regularly on Sundays and Holy Days, at least 16 years of age, and in good standing with the Church (including married in the Church if they are married). A baptized non-Catholic Christian may be chosen as a “Christian witness” provided there is one Catholic godparent. A former Catholic may not serve as either a godparent or Christian witness. Godparents will be required to submit a Certificate of Eligibility from their parish prior to the child’s Baptism. Announcements may be e-mailed, written or faxed to the Parish Office by 4:00 PM on Mondays or two weeks prior to the event announcement for publication. We have BINGO every Sunday evening at St. Paul School at 7:30 PM in the cafeteria. We give $1,000 in cash prizes in addition to TWO 50/50 games. Come join the fun and bring your friends and family! NO BINGO ON TUESDAYS. Contact the Parish Office for purchase information of in-ground burial for cemetery plots or for information regarding our mausoleum. If you are group or organization leader or a part of our parish personnel, please remember to frequently come in to the Parish Office to pick up your mail from your mailbox. With the fall season fast approaching, school starting, and Church programs and meetings beginning, it is recommended to appoint someone from your group or organization to stop by the Parish Office on a regular basis as not to miss out on receiving important mailings, inter-office communications or phone messages. Thank you for your cooperation and understanding. Each week of the month a member of the clergy, accompanied by some members of our parish visit one of the nursing homes in the area to bring Holy Communion to the Catholic residents, pray the Rosary, and let them know we care. If you would like to be a part of this ministry and would like to know what our visitation schedule is, please contact Clare Dugan at (609) 386-0121.